As announced ahead of Winter NAMM 2013, Sennheiser and TC-Helicon launched two products, developed by both companies in joint research since 2011. 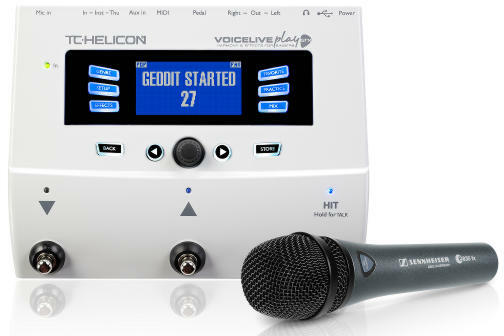 The two product bundles comprising of a special version of Sennheiser's vocal evolution microphone e 835 fx offering a remote switch for controlling one of two VoiceLive Play effects units by TC-Helicon respectively - tailor-made for singers and guitarist/singers for both, performing and practicing. At Prolight + Sound 2013, Frankfurt, the product bundles wer also shown at the Sennheiser and at the TC-Helocn exhibit. A special version of Sennheiser’s popular vocal microphone, the evolution e 835 fx, is the heart of both new bundles. The microphone features an effects control button that allows the singer to perform multiple actions, like switching presets or toggling HIT, LOOP, and TALK functions conveniently without having to reach for the effects unit. The Voice Live Play unit is connected using a standard XLR cable which transmits a switching signal when the microphone's button is pushed.